Entrance hall: With bench seat and coat hooks. There is the advantage of free wifi provided throughout the cottage and a land-line telephone which may be used on an honesty box basis. 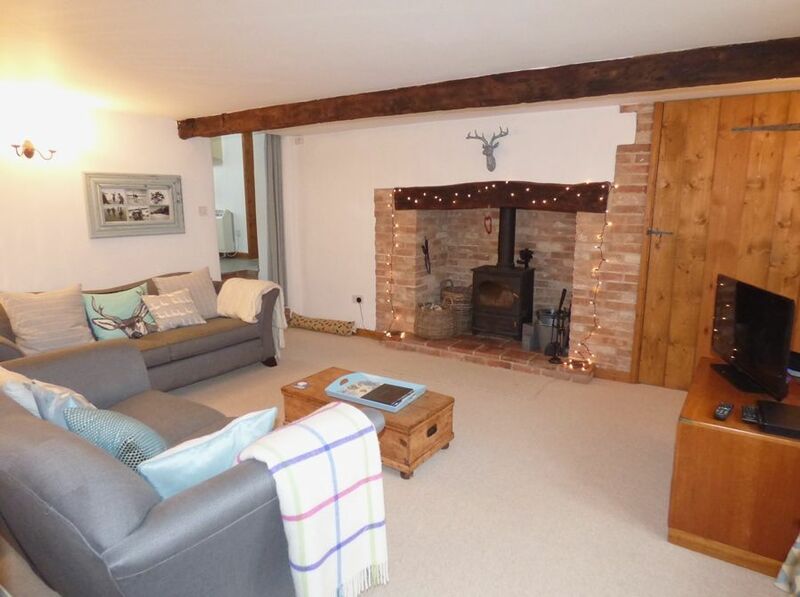 Sitting room: a charming spacious sitting room with a beamed ceiling and large brick fireplace housing a wood burning stove. There are two comfy sofas, lamp tables, freeview TV with DVD player, sound dock and a good selection of games, books and DVDs. From this room there are steps leading through to the kitchen. Kitchen/Breakfast Room: a superb full height spacious room overlooking the garden. The modern kitchen is well equipped with an integral electric oven with induction hob, slimline dishwasher, fridge with ice-box and a microwave. There is a round dining table which may be extended to seat six guests. From the kitchen there is access through to the back lobby with a pantiled floor, the back door leading to the private garden and the staircase. Cloakroom/Utility room: has a washing machine, WC and hand basin. Bedroom 3: this is accessed via the sitting room and has a wrought iron double bed, bedside tables and lamps, canvas wardrobe. The winding staircase is not too steep and there is a rope hand rail. Bedroom 1: Beautifully presented spacious room with a king-size bed, bedside tables and lamps, bedroom chair, built-in wardrobe and a chest of drawers. Bedroom 2: A second good-sized bedroom with twin beds, bedside tables and lamps, chest of drawers. Bathroom: contemporary walk-in shower, bath, hand basin, WC and heated towel rail. Whilst there is no designated off-street parking for Lime Cottage, there is a large lay-by opposite the cottage where there are no parking restrictions and it is usually possible to park. There is an attractive fully enclosed private garden at the back of the cottage which has a small lawned area and a patio with outdoor furniture and a barbecue, making it a perfect spot to sit out and enjoy afternoon and evening sunshine. Within a couple of minutes walk, there is an excellent gastropub, The Gin Trap Inn, well-stocked village shop, children's playground, church and easy access for walkers onto the Peddars Way and also to Ringstead Downs.